Unique 1930s Mansion with Original Interior Architectural Features and Occupied by German General during WWII. 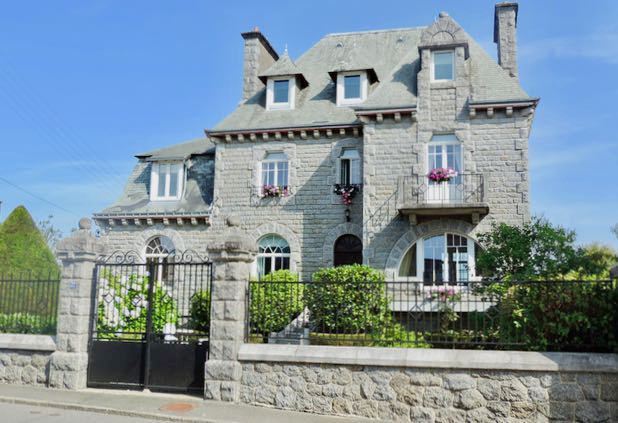 Renovated 1930s mansion with original interior architectural features, several French doors, beautiful solid oak stairs with carved newel post and 3 meter high ceilings. 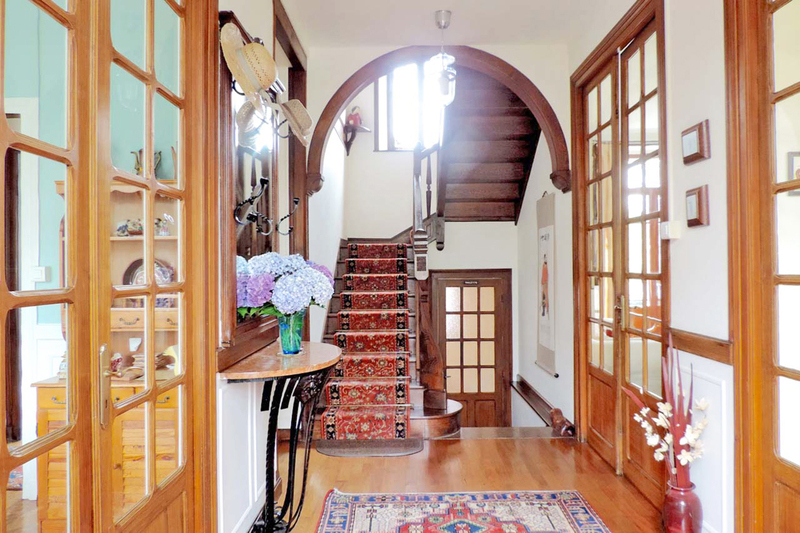 The integrated annex (lower side of the house) offers independent accommodation; it includes a separate entry door on the side of the property, bathroom, office, original solid oak spiral staircase, and 2 bedrooms. ENTRY LEVEL: Large entrance hallway with original 1930s hall stand, 3 sets of double French doors, guest WC, main solid oak stairs, living room with 2 double French doors diving it from the main dining room and patio doors to the back balcony, breakfast room, fitted kitchen, office, and full bathroom. A balcony runs the width of the building at the back. LEVEL 2: 5 bedrooms (2 en-suite - one with original sit-bath and hand basin), main bathroom, and large built-in closet on the landing. LEVEL 3: 3 bedrooms, the 2 back bedrooms with views of the countryside. BASEMENT LEVEL: The 75m2 walkout basement includes a double garage, storage rooms, furnace, oil tank, and side and rear entry doors to property. Two stairways lead up to the entry level. The property has oil fired central heating and a built-in gas fire in the living room. Equipped with a high speed ADSL Internet with phone and HDTV option, satellite dish and Freesat box for the reception of UK TV, French and international news channels. The mobile phone reception is excellent throughout the house. The property is connected to the town's main water and sewage systems. Energy rating “C”. 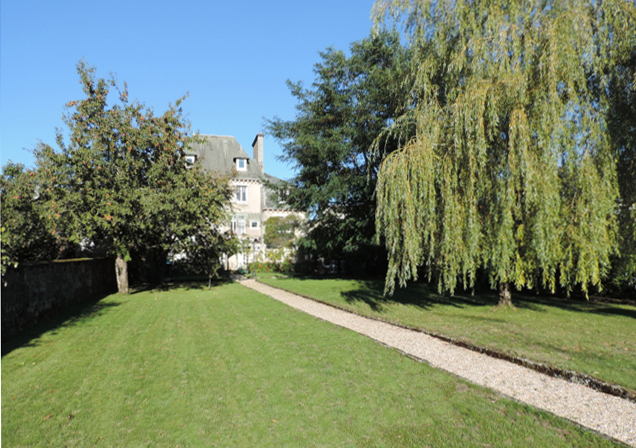 The property is surrounded by 1150m2 of enclosed landscaped gardens. To the rear there is a large courtyard with wrought iron entry gates and ample parking for several cars, paved patio/BBQ area. Beyond the yard there is a walled landscaped garden with potting shed, trellised patio, lawns surrounded by gravel pathways, flowering borders, and fruit bearing trees and bushes. The town center is within walking distance, as are bakeries (2), supermarkets (2), restaurants (5), bars, beauty salons, the various other businesses include: a traditional butcher, British grocery and Deli, gift, shoe and pottery shops and pharmacy. There is a town hall, church, post office, banks (3), library, schools (nursery, primary and secondary with many expat children enrolled, cinema (English and French language movies), medical center (3 bi-lingual doctors), dentist (1 bi-lingual), veterinary clinic (bi-lingual) and a train station. The train connects several times a day to the mainline Paris/Brest TGV station at Guingamp from there is it approximately a 2h45mins journey to Paris and CDG airport. The town is within an easy commute of Dinard, Brest, Rennes and Quimper airports and an hour's drive to the ferry port of Roscoff with sailings to the UK and Ireland. Large wrought iron entry gates. Granite faced with large arched windows and curved steps leading up to the front door. Large formal garden in rear. Interior garage has parking for 2 cars and the rear courtyard has parking for 4-5 cars. Opposite the house there is street parking.